A good story, terrible narration. While I enjoyed the story, the quality of narration was awful! The narrator messed us words, repeated himself, hit the microphone and pretty much ruined the book though I think that's more to do with the need for an editor because he did do a great job with the voices and bringing the atmosphere to life. I just couldn't get past the many mistakes. The book itself was good. The idea of the chair and what it made the little boy feel was incredibly creepy. The author has created an intriguing and scary read and I will definitely check out more by him! His descriptive writing and attention to detail was amazing and he drew me in from the start, it's just a pity the quality was so bad. What made the experience of listening to Born Burning the most enjoyable? I wouldn't exactly call listening to the book "enjoyable". It was a modern day Gothic horror tale. It was well developed, written and original. Joey, he was brave, intelligent, resourceful and insightful. When Joey's manipulative, maleficent, sinister, sadistic uncle met his fate. When Joey received his epiphany about his uncle's intent and motive. The story wasn't really my cup of tea, however it was a very good original tale. It was well written and developed. Both Joey and his mother were both concurrently going through a similar personal battle as Joey's mom had her own uncle Luse to deal with at work. Joey's mom realized something was amiss with Joey, however was completely out of tunes as to what the problem was. After Joey's father's death Joey's mother enlisted Joey's uncle Luse to help mentor Joey. Little does she know uncle Luses true sadistic nature. Very well written psychological horror tale. 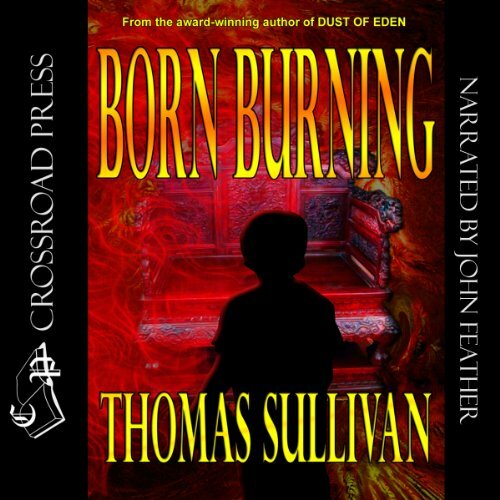 Would you try another book from Thomas Sullivan and/or John Feather? Definitely. This book was very well written, with many layers and subtle twists. The author did a great job in consealing if the chair was supernatural or not, left people guessing and thinking. I was not overly impressed with John Feather's narration. Perhaps I would have given a little bit more background on the chair and it's history and the history of it's previous owners, there was a blurb at the beginning of the book but not too much. John Feather did a reasonable job narrating the book; was not the greatest narration I have ever heard but certainly adequate. Did Born Burning inspire you to do anything? No, apart from listen to more audio books. I enjoyed this book. It is a well written tale of "is it or isn't it" as regards the chair. There are the classic good characters (Joey's mother), innocent (Joey) and evil (uncle Lucien). Best thing I can say is that I wanted to get to the end to see how the story unfolded. *This audiobook was provided by the author, narrator, or publisher at no cost in exchange for an unbiased review.